Wow! You must have been glad to have Native Dance back in your hands. That is beautiful, and I bet it quietly sings (jingles) to you as you wear it. Jewelry that not only looks good, but also makes a bit of sound as it is worn is hard to come by. Hope it makes it into Belle Armoire! Wow that's a gorgeous necklace! I’m really digging that necklace you posted. Very native American in my opinion. 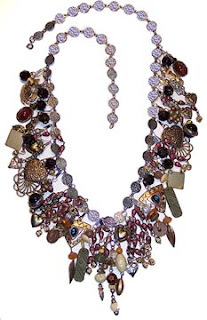 I like jewelry of all sorts, traditional, gaudy, upscale, cheap, fun, and shiny! Normally I wear things like mokume titanium inlay rings and tacky necklaces but I’d love to have something like this on hand for special occasions. I think it’d go over well with people too since no one I know has anything like that in their wardrobe.